This is what a final exam looks like at Missouri S&T. Sophomore and junior students in Ryan Hutcheson's class, introduction to design and engineering, got to choose which group project they wanted for their final exams. Two groups built powered beer can crushers that Hutcheson called "ridiculously overpowered," and one team build a remote-controlled tank equipped with its own t-shirt cannon. 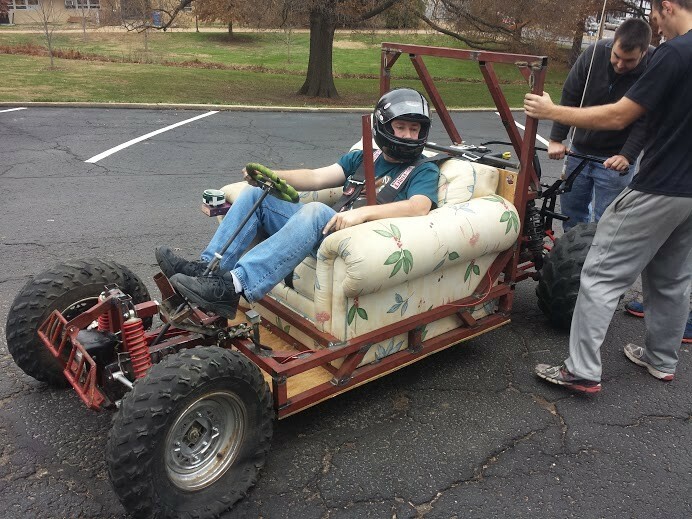 But the other three groups decided to go head-to-head in turning old couches into racers. "It had to go, it had to stop, it had to turn, and it had to be safe as well," Hutcheson tells Daily RFT. "It's not just slapping stuff together and seeing if it works. They did something pretty complicated." 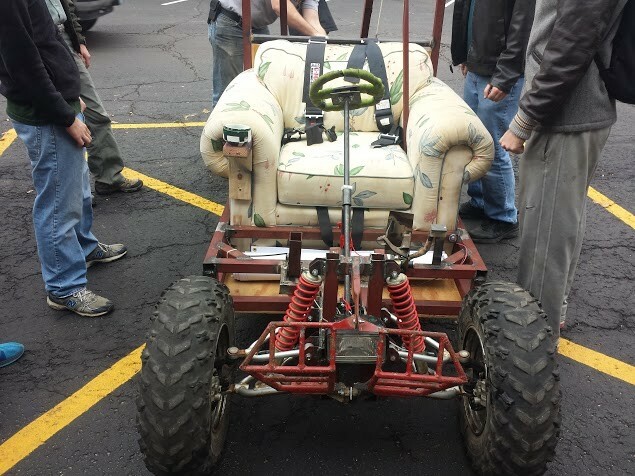 The students came up with three different designs for their racers: a two-engine couch equipped with the steering system of a zero-turn lawn mower, an all-electric tricycle and an off-road motorized couch. Getting ready for race day. Preparations for the race came down to the wire. 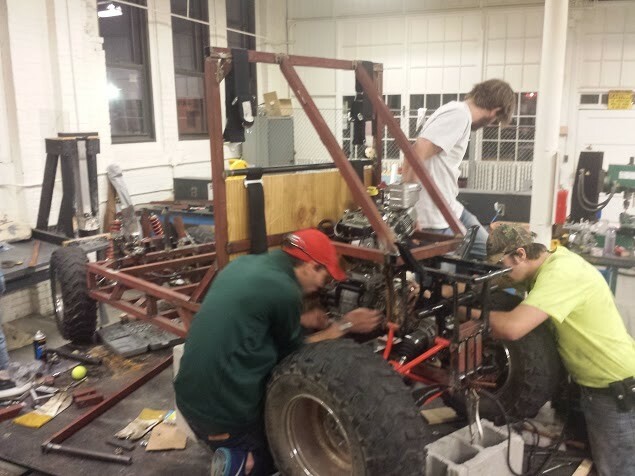 The electric tricycle didn't have working brakes until an hour before the competition, and students were still testing the transmission on the off-roader at 4 a.m. the morning before. "Basically they got it done the hour before the competition," Hutcheson says. So maybe it's no surprise that the dual engine racer, which had more time to test and twice as much power, was the big winner. "It was much faster than the other ones," Hutcheson says. Jon Silberhorn, the group leader for the team that built the off-road-style motorized couch, says his team worked from 8 a.m. until 4 a.m. the next morning to get their racer ready. Siberhorn and his teammates deserve an A+. Silberhorn says his team built their motorized couch using a four-wheel independent suspension, disc brakes, a 7.5 hp Briggs and Stratton engine, a five-speed transmission with reverse, push bar, headlight, tires from an ATV, a rear bumper, a frame made from recycled 1.5" box steel used to ship ATVs from Japan and, of course, a living room lounge chair. The students had a $50-per-student budget, or about $1,000, to build their creations. "The biggest thing they were supposed to learn from classes like this is just how to work as a team," Hutcheson says. "They'll always be working in a big team. That's the nature of engineering these days." All three teams earned As for their projects, Hutcheson says.